I love the way that first panel works as an image of four separate guys jumping from their horses to the train, but it also makes for one fluid motion from the left side of the spread to the right, showing the full arc of the leap(s). 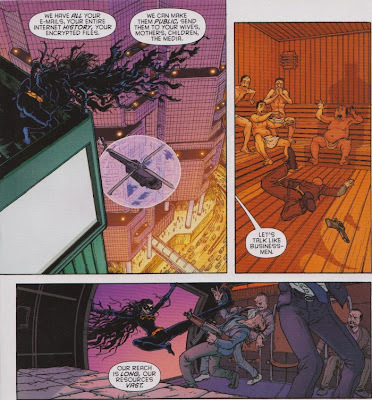 Rather than giving one image of a guy frozen in midair (or four guys all in the same jumping position), it fills in the "moments" of the jump, doing the work for the readers and giving the scene an animated quality without doing that Spider-Man thing where his motion is demonstrated by "ghost images" trailing behind him. But it's completely understated; you don't even realize that's what Hurtt is doing until you look closer. 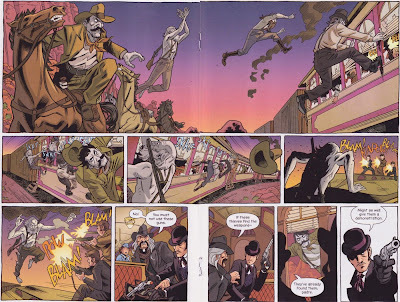 He does a similar thing in the second panel, with the zombies skittering along the side of the train like insects, each figure pressing closer to the reader, as if they're going to crawl right out of the page. As nicely-colored and clear as this artwork is, it's still creepy, scary stuff, and Hurtt really sells it like few others could. Another thing I've long dug about Hurtt, and one that's not always obvious, is his sound effects, which have a cool, hand-drawn style that incorporates them into the art in a way that complements the action without distracting from it. The barely-seen "blam"s in the first panel perfectly signify the gunfire coming from inside the train, where the battle is already raging, and the "skkr-skkr-skkr"s of the second and third panels wind among the characters and along the train creepily, while the "blam! "s and "pow" of the panel in the lower left corner seem to be emanating from in between the muzzle flashes. It's intuitive, a fluid combination of words and pictures to make a scene come to life, and that's what comics is all about, right? 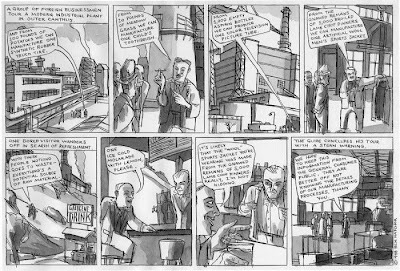 Finally, the last panel on the right page is a perfect capper to this series of moments, dropping out the background to signify a dramatic pause, while the gun points off the side of the page, beckoning the reader to turn and see what comes next. And when they do, they certainly won't be disappointed. 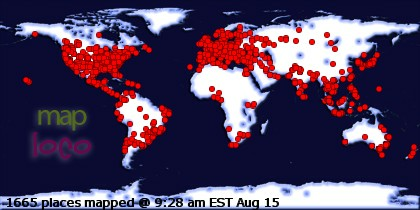 Wanna see what it is? Then buy the issue! Trust me, it's worth it. This series is awesome. 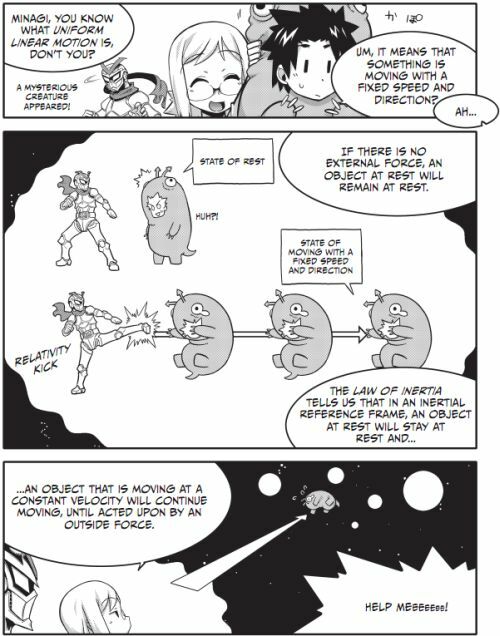 The Manga Guide series is an interesting one, grafting lessons in math and science onto oft-nonsensical plots, but managing to convey their subjects clearly and memorably. It might just be a cultural thing; American educational texts rarely attempt to entertain as well as teach, but Japan seems to embrace comics, cute characters, and silly comedy, so why not do so when teaching subjects that can be considered difficult and "brainy"? 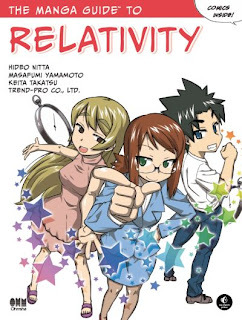 The Manga Guide to Relativity is a pretty standard example of the series, featuring an incredibly rudimentary plot involving a student tasked with learning about the subject over summer vacation and a teacher explaining it to him, surrounded with a few bizarre details, like a fey principal who gives weird demands to his charges, a dog for a vice-principal, and a girl who seems to be eavesdropping under the pretense of practicing various club-related activities. But that's all mostly-unnecessary flavoring; the real content of the book are the lessons, which are remarkably good at explaining the unintuitive world of relativity, from a quick history of physics, to descriptions of the nature of light, to easy-to-follow explanations of time dilation and length contraction, to examples demonstrating the curvature of space. It's a fascinating subject, and while it can be a hard one to grasp, this book makes it seem easy, or at least understandable, which is a pretty impressive achievement. In fact, this book might be the best I've read at understanding relativity, not just the concepts of what happens, but why. 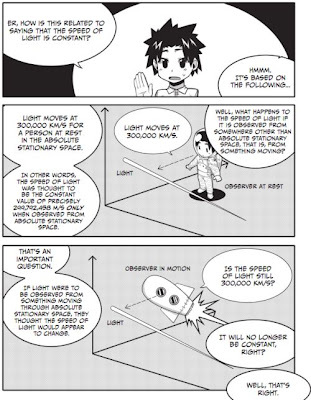 Explaining the history of physics demonstrates why the speed of light being constant is such a game-changing idea, and extrapolating from there that space and time are variable is a light bulb moment. While the details of the explanations are often pretty goofy and full of slapstick comedy or hard-to-translate jokes, the explanations themselves are excellent; this could really be a textbook introducing the basics of relativity to students. Of course, the general air of silliness would make this a hard sell in a classroom, at least as an officially-sanctioned text. There's a lot of nonsensical silliness, like the teacher smacking the student whenever he makes a dumb joke or gets distracted, and one chapter is full of gratuitous cheesecake when the teacher decides to give her lesson by the pool while wearing a tiny bikini. Lots appearances are made by a random superhero/robot character that doesn't really add much in the way of understanding, and the plot itself is pretty tacked on and distracting. But those are all minor annoyances, and they do add to the uniqueness of this presentation, especially with culture-specific details that occasionally pop up (I especially liked that Einstein's "Twin Paradox" is known as the "Urashima Effect" in Japan, after a folkloric character who briefly visited an undersea kingdom and returned to find that hundreds of years had passed in his absence). Overall, whether this is used in classrooms or just read by those with interest in the subject, it ends up being a pretty great resource, and hopefully a continuing example of the use of comics for education. Elsewhere, from a while back: I wrote a bunch about the recently-ended season of Fringe over at The Factual Opinion. Links: Hey, look, a huge chunk of Kagan McLeod's Infinite Kung-Fu is available to read for free on Top Shelf 2.0! I'm looking forward to this book, yes I am. 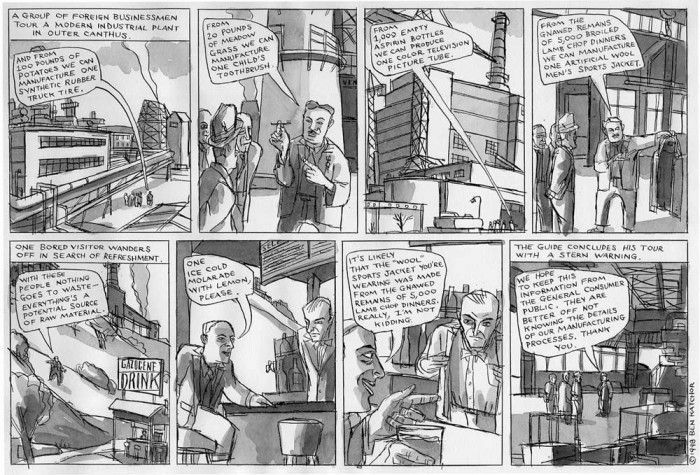 I really liked this webcomic, "Our Blood Stained Roof", by Ryan Andrews. He's a talent to watch, that's for sure. Interesting Kickstarters: This project by Molly Crabapple looks really neat, and while it's fully funded and then some, you can watch it on a livestream if you donate. And Box Brown's Retrofit Comics publishing effort is raising money; donating will get you all sorts of neat stuff, with comics by creators known and unknown and related merchandise, along with a sense of accomplishment for supporting indie comics. 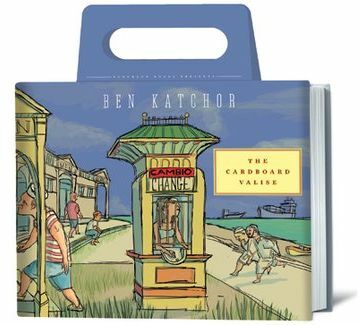 What to make of Ben Katchor and his somewhat goofy sensibility that still makes you think, or maybe just think you're not smart enough to keep up with all the activity that goes on in his comics? There's really nobody out there like him, with his scratchy artwork and squat, kneeless characters, his wordiness and just-left-of-reality mundanely-magical realism, his weird concepts and oddly poignant social commentary. His brain seems to work differently from everyone else's, but he's still close enough to "normal" to present his ideas in a recognizable manner which allows readers to recognize themselves and their world from a slightly different angle than what they are used to. It's a unique experience. This book is an excellent collection of Katchor's work, compiling strips originally published in various alternative weekly newspapers and filling the gaps between them with something of a throughline, although calling it a "plot" would probably be a bit strong. 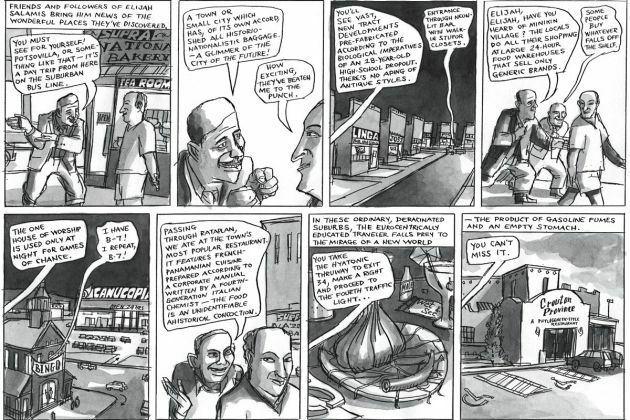 The strips follow some common themes, at first focusing on tourism and the effect that first-world countries have on the rest of the world, with a character visiting a small country called Tensint Island, which is famed for its public restroom ruins, has a native language that is composed of traveling salesmen's slang, and subsists entirely on canned food. But Katchor soon gets bored with or runs out of material related to that locale, so a strip sees it destroyed in ridiculous fashion so he can move on to matters back home, mostly in Fluxion city in a country called Outer Canthus, with occasional mentions of another, two-dimensional country nearby. 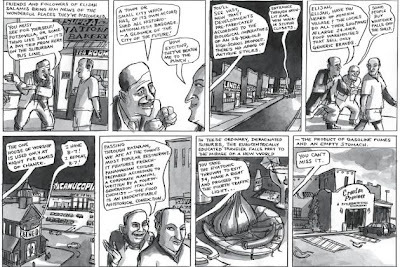 The book kind of just wanders around in whatever direction Katchor pleases from here on out, which can get a bit tedious (it probably reads best in small doses), but there are bits of genius on each page, with extended series of strips following some eccentric characters, interspersed with one-off bits describing odd customs or industries. We see a tourist who has returned home but keeps acting as if he is on vacation, wearing shorts and t-shirts or sunbathing in wintry weather and expecting his apartment to be maid up by a hotel maid. There's a man who refuses to recognize any nationalistic customs, including answering doorbells, and tries to spread a universal language called Puncto that has come up with words for everything possible (example: "orifulage": a half-empty tube of toothpaste). A religious leader preaches about the hungers and materialistic desires that persist after death. It's all weird, goofy stuff, but it's full of intelligence about society, pointing out the absurdities and oddities of modern life by emphasizing and exaggerating them or having someone react in ways that are just enough outside of the acceptable norm to stand out. It's hard to describe what it is exactly that makes this material so compelling, especially since it seems like it shouldn't work. Katchor fills pages with text, often having characters speak directly to the reader, sporting freakish, crazed expressions, but still seeming relatable. He manages to make their odd activities and pastimes understood without seeming tedious, and he introduces and abandons outrageous concepts quickly, yet weaves them all together into something resembling a whole, even if we feel that we can never quite grasp it in its entirety. There's something fascinatingly human about that, a reflection of how nobody can never really understand everything, no matter how hard we try. Maybe everything is all surface, but we try to dig below, to relate to people who are impossible to figure out. 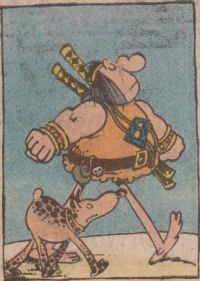 Are any of us, with our particular obsessions and habits, that different from Katchor's parade of goofballs? Not really, and this book has a strange, but fascinating, way of pointing that out, of illustrating the varied beauty of existence. That's something special. I love the casual “trip and tase” action and the facial expression on Alfred, but the detail that really gets me is the emoticon-themed masks of the bad guys, which gives them expressions that perfectly fit their individual situations. The guy getting tripped seems to be going “oh crap!”, the taser recipient has an eye-squinted “Augh!” look, and the guy in the foreground seems to have a wide-eyed questioning look. It’s hilarious, a series of perfectly-captured details. I don’t know if this was all Burnham’s invention, or if it was specified in Grant Morrison’s script, but either way, it’s done wonderfully. 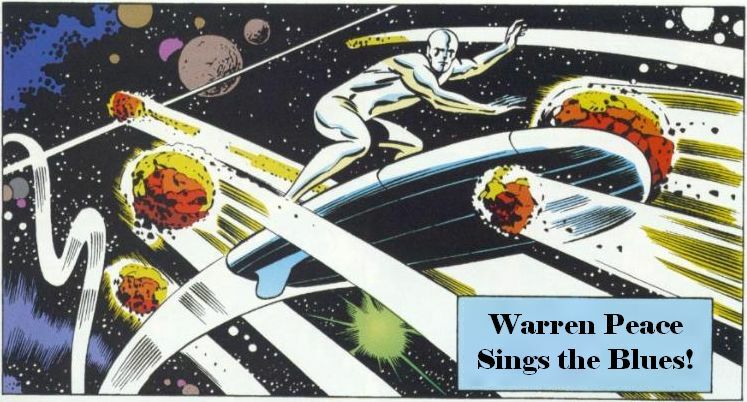 I love the staging there, and the way the robots' heads and shoulders provide the panel border. The tattered cape is just nuts there, a huge cloud of tangled fabric, but what I really love is that elongated leg kicking the guy in the face. That’s a great effect, really emphasizing the action without making it appear especially unrealistic. 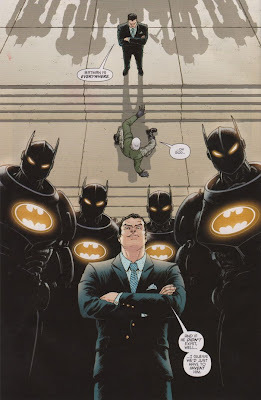 Morrison’s current approach to Batman seems to be a bit more of a lighthearted and fun take on the character, and Burnham is becoming the perfect artist for him. There’s nothing like murderous kids to spell out “evil”, and I love the gleeful look on their faces as they’re covered in gore. That’s not really lighthearted, but it sure is funny, and the huge smiles are another great example of exaggeration. I also wanted to mention the closing double-page spread of the issue, but I didn’t think it was fair to post it, so if you have the issue, check it out. It’s a series of panels of Batman and his pals all over the world beating up criminals, and it looks really cool, but I didn’t even realize until my second look how well it’s laid out, with the figures, buildings, and shapes all continuing from image to image, one guy’s torso leading into another’s face-kick, a ruined construction site turning into a high-rise building, all showing how well-coordinated Batman’s worldwide operation is. It’s a pretty amazing bit of artwork, images fitting together with perfect perspective and characters perfectly positioned and choreographed. If this is the kind of thing Burnham is going to be doing with Morrison on this book, I hope he keeps cranking it out for a long time to come.